If a keyboard shortcut is defined in Standard.kbd.cfg with a Shift modifier ( e.g. cue_set shift+d) the shortcut does not work at all. I tried to use other modifier keys like CTRL or ALT with no luck. Is there a way to see what key Mixxx receives? Works for me on Linux. I made some keyboard changes to fix the 'Keyboard shortcuts seek through library' bug so it's possible that I screwed this up. The fact that this happens on 1.7.2 as well is strange, and points to a Qt issue. You can see what key Mixxx receives in 1.8 by uncommenting lines 43, 68, and 133 in src/mixxxkeyboard.cpp. Thanks for the infos. Recompiled Mixxx to get these keyboard debug messages. See picture. Shrug I can't reproduce this. Maybe OS X or Qt version specific thing ? I'm on Qt 4.6.2. Mehh, makes working wit the keyboard kinda impossible. It is not QT versions specific for sure as it is the some problem with the official packages ( even 1.7). Will test it on another Windows PC cause in a windows XP VM with Mac OSX host it wont work either. I think it's a Mac OS X-only thing. QKeySequence doesn't seem to interpret strings like "Shift+[(native?) scan code]" properly on OS X. If I change ConfigValueKbd to use a string representation for parsing and do the same for MixxxKeyboard, the problem goes away. Attached is a patch that does that. Fixed in r2605. If keyboard shortcuts aren't working properly for anyone, please let us know ASAP. Thanks! Still not working here on OSX 10.5 & 10.6 . Then nothing on track 1 - plus now the library steals focus. If you have a track beginning with an "D" in your library pressing "Shift+D" makes your cursor jump to this track ( "works" on the sidebar too). it one more time, can you please test again when you have a chance? > Still not working here on OSX 10.5 & 10.6 . > Then nothing on track 1 - plus now the library steals focus. If you have a track beginning with an "D" in your library pressing "Shift+D" makes your cursor jump to this track ( "works" on the sidebar too). 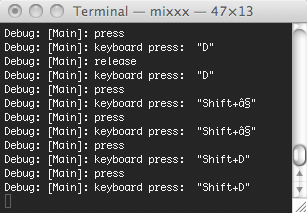 All Shortcuts working now on OSX with Standard.kbd.cfg, thanks for the fix. Similar to #8 if your focus is on the library, one can navigate with shortcuts in the library if you hit e.g. SHIFT+K (which is not in Standard.kbd.cfg ) cursor will jump to a track who`s artists name beginning with the letter K.
Same if your focus is on the sidebar, SHIFT+I will take you to iTunes.